Staircase Terms... Stair Components... Stair Parts Definitions... By Wood Stairs Canada. The Stair Parts Diagram Gives You A View Of How The Stair Terms, Components, Definitions For Wood Stairs and Railings System Are Liked Together. The stair parts used to build a 'post to post staircase' and a 'over the post staircase'. Bracket:Referred to as tread or stringer bracket. A scroll shaped decorative member usually mitered to the riser and fastened over the open stringer. Cove Moulding: Cove Moulding is a finishing trim used to go under the treads front side where the riser meets the bottom of the stair treads underside, to hide the little 1/8 in. and 1/16 in. gaps that may be there after the install. Ogee Cove Moulding also is used under the front nose of the stair nosing on any level run stair nosing that is installed on the job... once again hiding all the drywall dips along the walls face. 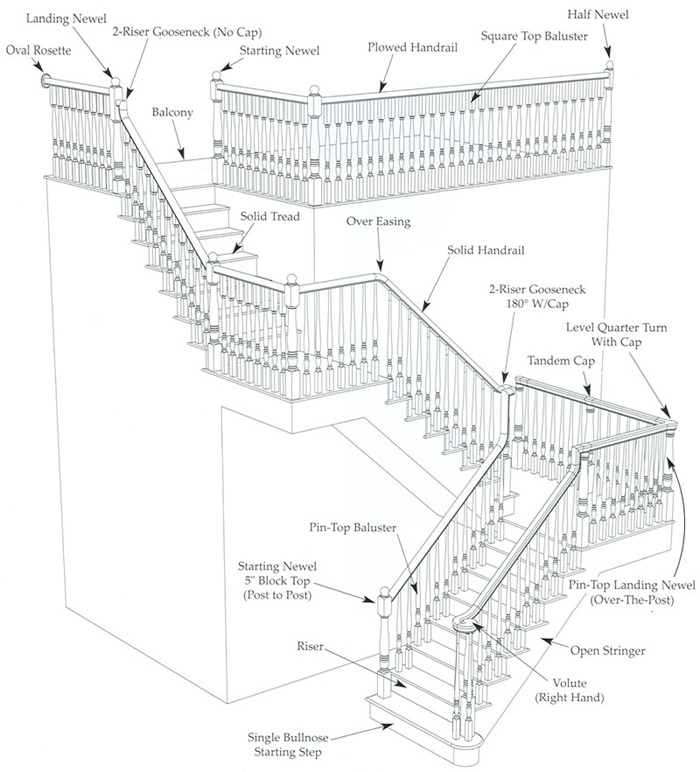 Landing Newel: The newel post used at landings and upper levels where rake rail changes direction and continues or where rake rail rises vertically to meet level rail. Length is typically 42" long, if yopu want to meet a 36" rail height code -or- 48" long newel post get used if you want to meet a 42" rail height code. Rake: The angle or pitch of a stair�s ascent to the upper level. The rake is established by the rise and run. Starting Newel: The vertical post used to start a balustrade system. These newel post are typically 48" long. Tread: The flat horizontal component of a stair step upon which a person walks... a standard tread is 1-1/16 inch thick.